As President Obama finishes up his second term and makes way for Donald Trump, whose inauguration is on Friday, we’re taking a look at six homes for sale around the U.S. with links to past, present and future presidents, as well as their close families. A modest ranch near Middleburg, Virginia, which John F. Kennedy and his wife, Jacqueline, built in the early 1960s is decidedly less known than the glitzy Kennedy compound in Hyannis Port. The former first lady designed it herself as a weekend retreat away from the White House, but sadly the family only spent three weekends there before JFK was assassinated in 1963. The property was sold a few months later. The four-bedroom property, which she named Wexford after the Irish county where her husband’s ancestors lived, is currently back on the market for $5.95 million. This is down from $7.95 million in September 2015 and $10.99 million when it first was put up for sale in 2013. Another Kennedy-linked property for sale is the "Lasata" estate in the Hamptons, designed by architect Arthur C. Jackson and built in 1917. It’s famous for being the Bouvier family’s summer home during the 1920s and 1930s and was where future first lady, Jacqueline Kennedy Onassis (simply known as Jacqueline Bouvier in those days), spent her childhood vacations. Set on more than seven acres of land in posh East Hampton Village near the ocean, it includes a 10-bedroom house that was restored in 2007, a one-bedroom guest house, a two-bedroom pool house and a three-car garage building. It’s currently owned by fashion designer and ex-Coach creative director Reed Krakoff and is on the market for $38.995 million. Adjacent land can be purchased for $14.995 million. The Hamptons was not only a favorite vacation haunt with the Bouviers. Chester A. Arthur, who became the 21st president in 1881 after his predecessor James Garfield was assassinated, spent some of his down time in a property dubbed the "Summer White House" in Sag Harbor, according to listing agent Michaela Keszler of Douglas Elliman Real Estate. That was long before the Hamptons became the trendy vacation spot it is today. The three-story, six bedroom Victorian mansion, which was built in 1796 and has been recently renovated, is for sale with a $14.2 millionprice tag. Features include a library with fireplace, a formal dining and living room and a family room overlooking the garden and swimming pool. This Martha’s Vineyard home served as the summer White House to President Obama, his wife Michelle and their two daughters, Malia and Sasha, back in 2013. Known as Chilmark House, it boasts panoramic ocean views of the South Shore and Chilmark Pond and is currently for sale for $19.125 million, down from $22.5 million when it was first listed in July 2015. 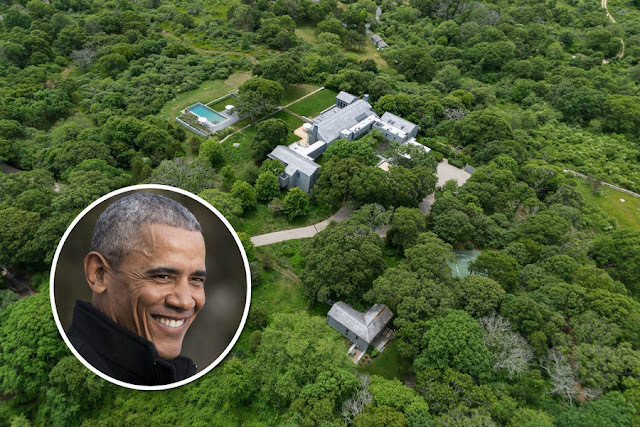 Set on nine-and-a-half acres of land and with its own private road, this property no doubt acted as a perfect summer hideaway for a president who didn’t want his every movement seen by the press. In addition to privacy, other features include a heated infinity pool, half-basketball court, a large-screened porch, outdoor terraces and a two-bedroom guest cottage. Donald Trump’s childhood home in New York City’s borough of Queens may have justbeen scooped up by a property developer buyer for $1.39 million (about $140,000 above its asking price), but it’s already available again. No doubt hoping to make a profit on Mr. Trump’s newfound position, the new owner is putting the five-bedroom brick-and-stucco Tudor house up for auction through auctioneers Paramount Realty USA. The auction is already open remotely and closes at 4 p.m. tomorrow (Jan. 17). Mr. Trump’s father built the house in the well-to-do neighborhood of Jamaica Estates in 1940, and the address is listed on Mr. Trump’s birth certificate. The family later moved into a grander house around the corner when he was 4 years old. Ivanka Trump, who is widely rumored to be taking on a First Lady-like role during her father’s tenure as President—and whose husband, Jared Kushner, will bea senior adviser to Mr. Trump—recently put one of her Manhattan apartments up for sale with a $4.1 million price tag. City property records show that the future first daughter paid $1.52 million for the condo at Trump Park Avenue on Manhattan’s Upper East Side in 2004 and transferred ownership to an LLC that reportedly belongs to her in 2015. However, while she is rumored to be moving to a Kalorama mansion in a Washington, D.C., she won’t have to stay in a hotel when she visits New York, either, as the home that’s now on the market isn’t believed to be the family’s main residence.They live in a four-bedroom penthouse in the same building, according to numerous media reports. 0 Response to "Six Presidential Properties for Sale"